The hillside villa has fabulous views and plenty of space, with easy access to the French Riviera and Provence. The village of Figanieres -- a five minute drive or 30 minute walk -- has narrow streets and an old church. The region is full of wonderful villages, where rural life is thriving. The centre of village life is the (child friendly) bar. There are also great pastry / bread shops, smaller grocery stores, a post office, a natural spring with the best water you have ever tasted and a tourist information centre. A ten minute walk from the house across the vineyards is the nearest wineries, where the excellent local rose may be stolen for 5 Euros a bottle. On a clear day you can see the Mediterranean from the village. We are an English / American family living in England and the United States. 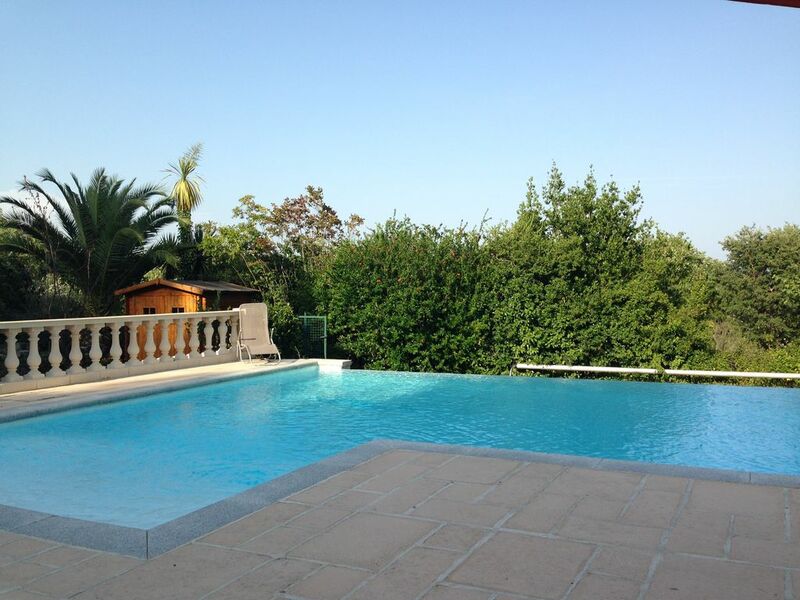 Villa Serendipity has the perfect quiet and secluded location tucked in the Provencal foothills, 30 minutes' drive from the French Riviera and an hour from Nice airport. Thirty minutes drive to the north, you are surrounded by serious mountains -- the gorge at the Parc Natural Regional Du Verdun is world class spectacular. There’s plenty of water sports, hiking and skiing (in winter) in the area. Serendipity is a spacious, gated home surrounded by vineyards, farmland and woodland offering great views across the valley and the mountains beyond. With a large, secluded private swimming pool, extensive grounds and charming villages all around, many visitors don't stray far. The house has its own large swimming pool with loungers and umbrellas on the deck. It has three double bedrooms (two en-suite) and two additional bedrooms, a a double and a single. Serendipity has a large kitchen, two living rooms and a tiled, sheltered dining terrace. There is both a gas grill/BBQ and a wood outdoor bread/pizza oven as well as a full kitchen inside. It has broadband wireless internet, British TV, There is a boule area, olive trees and plenty of private parking inside the grounds. En-suite to Bedroom 1 with tiled shower, sink and wc. En-Suite to Bedroom 2 with shower and sink. Large bathroom with separate shower cubicle, bath tub with shower, sink and bidet. There are two additional wcs, one with sink. Closest skiing resort is less that 45 minutes. Isola 2000 is 2-3 hours drive. There are two double bedrooms and all of the communal areas are on the ground floor, easily accessible from the parking area. Plenty of room inside and out for 10 guests, good size pool and everything we needed for a great weeks stay. Lots of pretty little villages close by and the coast within an hours drive. We had a mixture of exploring the area and staying around the pool. All in all it was a great property in a great location, would definitely recommend. We stayed with our four grown up children, all having managed to get some time off together, and enjoyed a fabulous, relaxing time in each other's company. The house was perfect for us: plenty of room for all of us to be together yet still have some space. We went in February so it clearly wasn't going to be a poolside holiday, but we enjoyed breakfast in warm sunshine on the terrace most mornings which was lovely. We loved shopping in the local shops and markets, then cooking in the well-equipped kitchen; watching films, playing cards and just chatting around the wood-burning stove; excursions up to the magnificent Verdon Gorge and beautiful villages in the area, as well as to the coast. The Musee de l'Annonciade in St Tropez has a small but fascinating collection of 20th Century avant-garde painting. All in all a great holiday in a beautiful part of the world and a house that suited us perfectly. This villa is beautiful, spacious and very private. We had a wonderful time! The beds are comfortable and everything works. Something you don't get in every villa! My daughter had only just started walking, but her falling over was nothing to worry about in the villa. We slept in the downstairs bedroom and there was a stair gate to stop her going upstairs. We could easily move the furniture on the terrace to make it safe from steps and when she was in the garden, she couldn't get to the pool because of the gate. It's a secluded villa, off the beaten track, but it's also in a great location if you want to drive to some of the sights that the South of France has to offer. Figanières is a lovely, friendly little town with no signs of tourism. I loved walking into the town every day through vineyards to buy fresh bread. I managed to get by with my awful French and people just seemed grateful for my effort. We went out for several lunches to some great restaurants nearby. There's also plenty of vineyards to choose from within a short drive. Wine tasting is A LOT OF FUN! Fantastic villa. Kids loved it. We had a great family holiday here. The villa is really comfortable and had everything we needed. It’s situated in a beautiful yet quiet part of the French countryside. Despite the seclusion, it doesn’t feel too far from civilisation and is an easy drive to the coast with St Maxime, Cannes and Nice a relatively short drive away. The kids loved spending time in the pool which kept them occupied whilst we relaxed. Figanières is a typical French town and very friendly. The owners rep met us at the house, let us in, showed us round and was on hand to help throughout the time we were there. The Côte d’Azur is a fantastic holiday destination and we loved it. The house was a great base from which to explore the area and a beautiful place to return to and relax. The Villa is spacious and family friendly. Terrific infinity pool with a walk in shallow end that was great for the small children. Wonderful views all around, from the villa or down at the pool. We visited a couple of the vineyards close by they were good fun. Went to the market and had lovely lunches in the surrounding villages. Overall the Villa Serendipity exceeded expectations. Thank you, we will certainly look you up next time we are in the area. The French Riviera is close -- it is is 30 minutes' drive to St Tropez and San Raphael. Cannes and the L'Esteral beaches are 45 minutes' drive. Nice is an hour away. Nice Airport / train station is one hour's drive. Marseille Airport is 90 minutes away. Les Arcs train station is 20 minutes' drive. The town of Draguignan is less than 20 minutes away. The nearest village centre at Figanieres is a five minutes drive (two miles). The Gorge at the Parc Natural Regional Du Verdun is less than an hour. It's 90 minutes to Monaco and Avignon / Nimes. There is a patchwork of fabulous and picturesque villages within 15 minutes such as Chateaudouble, Bargemon and Callas. They all have a range of authentic restaurants and village shops. There are large supermarkets and out of town shopping districts within 20 minutes. Booking Notes: Please contact the owner. Changeover Day: Preferred changeover day is Saturday. We have some flexibility especially off season. Notes on prices: We will always consider requests for shorter or longer stays. Please ask.